When law student Harper (Tye Sheridan – X-Men Apocalypse) wakes with an almighty hangover the last thing he expects at his front door is threatening tough guy Johnny Ray (Emory Cohen – Brooklyn) and his girlfriend Cherry (Bel Powley – Diary Of A Teenage Girl), but he soon comes to realise that a drunken bar conversation the previous night is about to turn into a dark and dangerous reality. Harper obsesses that his step-dad Vincent (Stephen Moyer – True Blood) is responsible for the car crash that has left his mum in a coma, and Johnny Ray is here to drive them all to Vegas where he’s agreed to kill Vincent for $20,000. Harper’s claims he was drunk when he hired him fall on deaf ears and he realises he might not be able to change course; if he wants to survive this, he needs to carry on down the road he’s already chosen, even if there’s clearly danger up ahead. 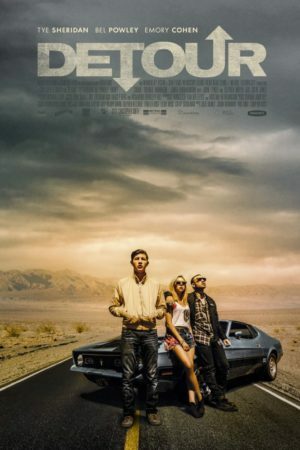 Detour is a tense, stylish and deftly constructed noir thriller from writer/director Christopher Smith (Triangle, Creep, Severance, Black Death).